Now, whether you’ve been naughty or nice this year (we’ll let you be the judge of that), there’s no escaping the fact that December brings with it a bucket list of expectations. It goes a little something like this: 101 Christmas party engagements, offensive and outlandish jumper displays, an unnecessary amount of mince pies before, after and in-between meals, and of course, an obligatory trip to Albert’s Square to see Santa in all his glory. But where is the time I hear you ask? And I hear you, this time of year has to be one of the busiest and while we’re all about spreading festive joy, we understand that the pressure and stress of festivities can be all consuming. We’ve been talking a great deal about slow living, tuning in and taking the time to prioritise yourself in the run up to Christmas, but we appreciate that no one wants to miss out; not even the scrooges. So for this week’s GYCYP round-up of the best things to see and do in Manchester we thought it was high time that we did a Christmas take-over. Rounding up the best of the Christmas Markets and giving you the low-down on some alternative craft and retail events taking place across the city. This week Yolklore took to the Xmas markets to find the best food and drink, crafts, hidden gems, and stocking fillers, braving the elements (it is Manchester after all) to provide you a comprehensive guide of what not to miss this year. We’re all about waking you up from the sleepwalk of life and helping you off that hamster wheel. It’s a big old world out there, so don’t hesitate, grab your coat (*garish Christmas jumper), and join us as we seek out the best things to see, do and experience this festive season. The Manchester Christmas Markets are open until December 22nd. The main hub is located on Albert Square will stay open for an extra day until December 23rd. Albert Square: 10am to 9pm. We started our expedition at the top of King Street sampling the best of the French market, meandering onto Albert Square before heading to Exchange Square and the Cathedral Gardens, finishing up at St Ann’s Square. Typical length 2 hours, depending on the number of alcoholic beverages consumed! It will come as no great surprise that the best fromage on offer this year came courtesy of the French Market located on King Street, just off of Deansgate. Vincenzo from The Best of Italy - purveyors of cheese, salami, ham, and Italian wine, highly recommend the Goats Cheese, and it didn’t disappoint. Further down the street, Eat Greek bring a taste of the Med to Manchester with their utterly delectable halloumi fries served with a drizzle of mint yogurt and pomegranates. We also suggest a trip to Soaps of Provence, not only for their beautifully crafted soaps, but for their antique serving trays. Head to the south side of Albert square for a winter warmer cocktail courtesy of Bar Humbug. Meeting another friendly face, Jonny, we were treated to the Polar Espresso cocktail (£7.50) and Luxury Hot Chocolate (£3.50). We’ll definitely be trying the Johnnie Walker Hot Toddy and toasted apple infused gin on our next visit. Looking for gift inspiration on Albert Square, we recommend Snugglebottle - herbal and holistic heat packs for you and yours and satisfy that sweet tooth with Zara Cakes; almost too pretty to eat…almost. Peruse the pottery delights of Interlude Ceramics, wheel thrown stoneware pottery with colours inspired by the Lakeland seasons. Venturing from Brougham Hall Penrith, Mary uses a variety of stoneware clays at a range of kiln temperatures to create a stunning range of decorative bowls, vases and interior items. Bespoke designs and intricate details we loved the finishing touches and inspiring colour palettes. Warning - consumption of Elsie May’s Cookie Dough on Exchange Square may render you utterly useless for the rest of the day! Milk chocolate cookie dough topped with chocolate sauce and cream, oh and a shot of Bailey’s, because it is Christmas after all. If you have room left (hats off to you) treat yourself with a post-pudding tipple of Christmas Pudding liqueur from Ice Cold Vision located just outside Selfridges. Some lovely independent makers and creators are dotted all around the markets this year, including DPNY Crafts - who design these brilliant 3D and 2D acrylic wooden lamps. A range of designs, from cactus’s to headphone lamps, these lighting features are a great way to create those hygge vibes at this time of year. Want to win Christmas this year? Treat your friends and family with Kin Vodka - Toffee vodka from the heart of the British Lakes. Inspired by the the beauty of the Lake District and a passion for the great outdoors, this smooth blended vodka, rich in caramel tones with an oh so subtle kick, is the perfect gift this year. We would recommend the Chocolate Shot Glasses gift boxes for a corker of a pairing. Kin Vodka is located on St Ann’s Square. There’s no denying it, Manchester isn’t exactly tropical this time of year, so make sure to wrap up warm and finish your trip to the markets with a mulled wine at Manke Markets located on St Ann’s Square. Serving traditional German beer and gluhwein, delicious bratwurst, krakauer, and schnitzel on the grill this is the perfect pit stop. Just around the corner you’ll find the Birdie photo booth, a vintage VW Campervan so make sure to make some memories and tag your photos using the #MCRChristmas hashtag to have you lovely face shared on social media! Our Grab Your Coat round-up wouldn’t be complete without a sneak peak at some of the other events taking place across Greater Manchester this next week. 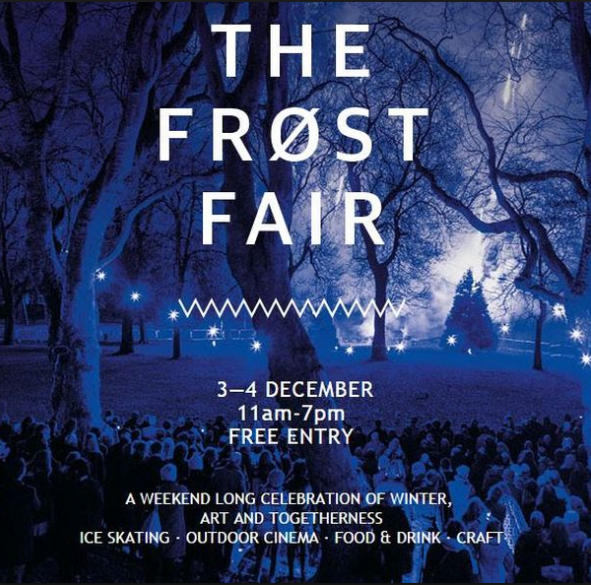 From independent makers markets, to late night shopping experiences and circus inspired frost fairs, celebrating art and togetherness, the first week of December is shaping up rather nicely, if we say so ourselves. Back for it’s third year, EtsyMCR takes over the People's History Museum to showcase handmade gifts from over 40 Etsy sellers. Kicking off this Friday evening with the Museum's annual Winter Warmer Late Night Shopping experience, with Mulled Wine, Mince Pies and Live music from She Choir. FREE ENTRY all weekend, including access to the Museum as well. Roll up, roll up and get ready to experience a two day celebration of winter, art and togetherness courtesy of The Whitworth Art Gallery. Trust us, this is a Christmas extravaganza that you don’t want to miss. The Whitworth Frost Fair will celebrate 250 years of the circus in Britain, so expect the full works, we’re talking ringmasters, circus troupes and trapeze performances. Family Floristry workshops, Have-a-Go circus Skills, all star DJ sets and outdoor cinema experiences; truly something for everyone. Peruse the Artisan Craft Market and make sure to grab a slice of the woodfired Pizza from Proove or Mediterranean inspired cuisine from the Ottoman. A lovely mid-week retail therapy experience brought to you by SO Marrakech. The concept store based in Levenshulme specializes in homewares and accessories handcrafted by artisans of Morocco, using only the best natural materials, including raffia, wool, leather and silk. 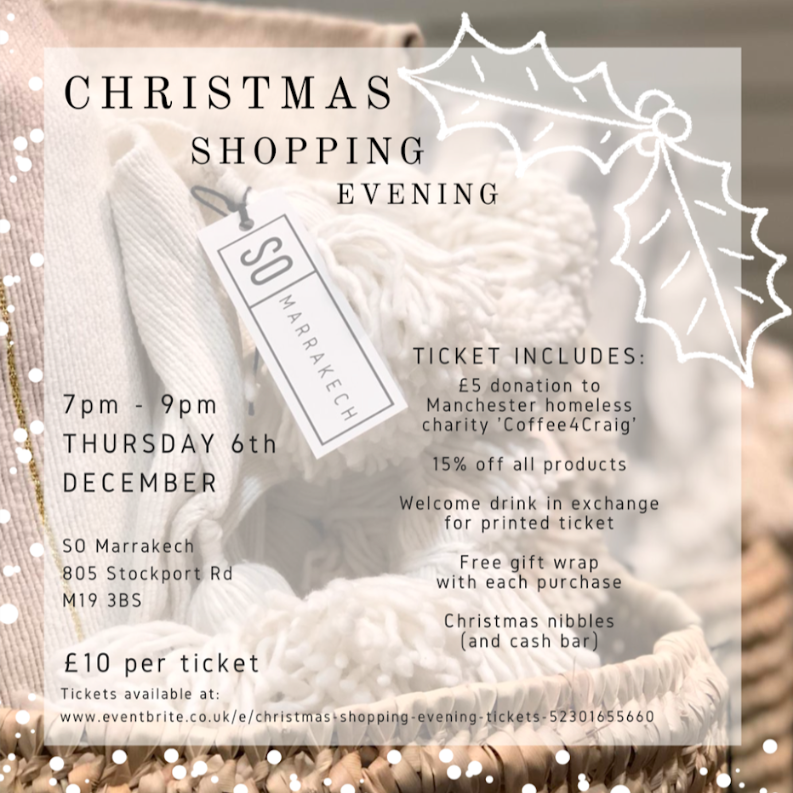 Next Thursday they’ll be spreading the Christmas cheer hosting an evening of shopping, with an exclusive 15% of all products, free gift wrapping, welcome drinks and much more with every purchased ticket.